Dave Nettle approaching Canada’s Mt. Loki on the Turner glacier. Photo by Reuben Shelton. 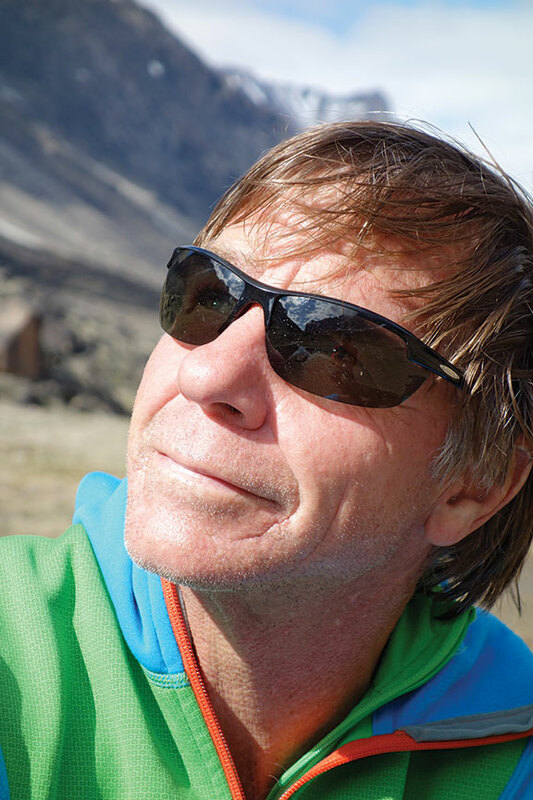 Dave Nettle is a consummate mountain adventurer, with climbs ranging from the Sierra Nevada to the Himalayas, the Alps to Baffin Island over the course of 42 years. A familiar face to many Tahoe-area climbers and skiers, Nettle worked at the North Shore’s Alpenglow Sports for 16 years and is the co-founder of Alpenglow’s Winter Film and Slideshow Series, often presenting his latest expedition to a packed audience. Now a technical director and instructor for Reno’s Ropeworks, he brings decades of expertise to professional rope rigging while still squeezing in amazing adventures on a regular basis. How did you get started in climbing and mountaineering? I’ve been climbing since 1972, but what I think is more significant is that I’ve been climbing continuously since 1972 and I’ve never burned out. It’s an integral part of who I am, and I’m still fired up seeing the world. But it really started with long backpacking trips—I hiked the Pacific Crest Trail at 17 and the Continental Divide Trail at 18 in 1975 and ’76 before either trail was complete. When I wasn’t hiking, I was living in Southern California and going to Joshua Tree or Tahquitz or Yosemite every weekend to climb. It was during the oil embargo so my buddies and I would use our ration tickets to fill up our cars each day, ride our bikes to school, then siphon all the gas into my Camero so we could climb all weekend, sputtering back on an empty tank. Why did you pick the Tahoe area to call home? I was managing a mountaineering shop in the ’80s in Sacramento making $20 an hour, but I really wanted to move to Tahoe, so while working at a camp in Sequoia National Park I called Don Fyfe at Alpenglow Sports from a fire lookout radio and said “I want to work for you,” and took the job at $4.50 an hour. Living and going to school in the Sacramento area, Tahoe was the place. I was fond of climbing Donner Summit and Lover’s Leap, and Tahoe was, and is, a sustainable, cool community. People really want to be here because of the lifestyle, and truly enjoy the kindred spirits. How do you balance your life, work and pursuing your passion for adventure? You’ve established major routes. Why not go the way of the professional, sponsored climber? A personal sponsorship is using your public persona to raise awareness for a company to sell their product. There’s nothing wrong with that, but I equate climbing to independence and freedom, and I want to make my own calls. If halfway up I decide a climb is too dangerous, I want to be able to turn back without letting a sponsor down. From where I’m sitting, after the fact, I get so much more satisfaction having done it on my own, with the support of friends, family and the people you meet along the way. How do you assess and manage risk on major climbs? My general philosophy is I don’t turn back, I get turned back. I make an evaluation and say, okay, it’s not storming yet, let’s keep going until I need to turn back. My experience is often providence kicks in and the storm clears. Coming off one climb on Baffin Island, we were rappelling and leaving behind more equipment than we thought we would need to, so we evaluated the situation and decided to go down a snowfield without axes or crampons, but if that had turned to ice we would have gone back up and kept rappelling. I’m rarely looking at one exit—I walk through one but have others in mind. What is your philosophy for keeping it fun during extreme, harsh conditions? The glue is humor. Don’t take any of this too seriously because you may lose your juice. Share the humor with Sherpas or talking smack with your buddies. It’s better to be laughing. A lot of people equate their stoke with accomplishments of climbing harder grades, running faster times; for me, it’s more about doing it and being with good friends in new places, regardless of the grade. At 56, I have to plan big trips carefully, but I want to be stoked about whatever I do. You’re also an accomplished backcountry skier. How did you get into that? At first, skiing was more of a way to get into the backcountry or to climbs. I started in the Sierra when I moved to the Sacramento area, and I was part of the early three-pin telemark movement in Tahoe. In 1982, we skied the length of the John Muir Trail (Mammoth Mountain to Mt. Whitney, about 200 miles) on Nordic gear. It was more for the adventure than the turns. What was your first big mountaineering trip? 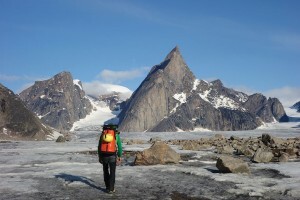 I’d been climbing and backpacking, and I was very goal oriented, so I thought, ‘wouldn’t it be cool to do [Alaska’s] Mt. McKinley—if I can hike across the country, why can’t I climb this mountain?’ I started planning with three other buddies, and two ended up dropping out. We climbed the West Buttress and I was hooked. I had Alaskan fever. I’ve been back on nine expeditions. How did you choose Baffin Island as your last big trip? Part of the challenge—and frustration—is that you can’t do everything you want to do all at once. There are three basic factors: having the time and the money to do a trip, having the physical and technical ability to do the trip, and having a partner who can do it, too. I would have loved to go to Baffin years ago as a big-wall granite junkie, but I was in Nepal or climbing [Pakistan’s] Trango Tower. You have to be okay with not doing it all at once. You have to do what can be done, and be in it for the long haul. If not, work and relationships suffer. First, I’m getting married in July, and we’re going to spend three weeks climbing in Europe. After that, in spring 2015, we are going to northern India to climb a 21,500-foot peak called Bhagirathi 3. It’s one of the most spectacular faces in the Himalaya, in my opinion; it’s like El Capitan in Yosemite with a 600-foot ice climb on top of it. Nettle on Canda’s Baffin Island in 2013. Photo by Reuben Shelton. What’s your favorite Tahoe-area climb? Your favorite backcountry ski run? For a climb, my go-to is Black Wall on Donner Summit, and I basically do a 10 pitch linkup by climbing and rappelling a series of classic routes to create a great day. For those who know, I start with One Hand Clapping, and end on Bourbon Street. For my favorite ski, I would have to say Rubicon Peak down the east side of the summit because it has the most consistent drops and doesn’t bench out like some. It also has some of the best stands of old-growth trees. No matter how skied out it is you can always find fresh snow with a little creativity.